For other uses, see Gord (disambiguation). 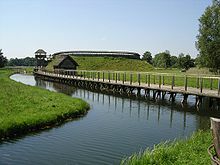 A gord is a medieval Slavic fortified wooden settlement, sometimes known as a burgwall after the German term for such sites. Gords were built during the late Bronze and early Iron Ages by the Lusatian culture (c. 1300–500 BCE), and later in the 8th–7th centuries CE, in what is now Poland, the Czech Republic, Hungary, Slovakia, eastern Germany, Romania/Moldova, Belarus and western Ukraine. These settlements were usually founded on strategic sites such as hills, riverbanks, lake islands, or peninsulas. A typical gord was a group of wooden houses built either in rows or in circles, surrounded by one or more rings of walls made of earth and wood, a palisade, and/or moats. Some gords were ring-shaped, with a round, oval, or occasionally polygonal fence or wall surrounding a hollow. Others, built on a natural hill or a man-made mound, were cone-shaped. Those with a natural defense on one side, such as a river or lake, were usually horseshoe-shaped. Most gords were built in densely populated areas on sites that offered particular natural advantages. As Slavic tribes united to form states, gords were also built for defensive purposes in less-populated border areas. Gords in which rulers resided or that lay on trade routes quickly expanded. Near the gord, or below it in elevation, there formed small communities of servants, merchants, artisans, and others who served the higher-ranked inhabitants of the gord. Each such community was known as a suburbium (Polish: podgrodzie). Its residents could shelter within the walls of the gord in the event of danger. Eventually the suburbium acquired its own fence or wall. In the High Middle Ages, the gord usually evolved into a castle or citadel (kremlin) and the suburbium into a town. Some gords did not stand the test of time and were abandoned or destroyed, gradually turning into more or less discernible mounds or rings of earth (Russian gorodische, Polish grodzisko, Ukrainian horodyshche, Slovak hradisko, Czech hradiště, and Serbian gradiška/градишка). Notable archeological sites include Biskupin, Poland; and Bilsk, Ukraine (see Gelonus). The term ultimately descends from the reconstructed Proto-Indo-European root ǵʰortós, enclosure. From this same root come the Germanic word elements *gard and *gart (as in Stuttgart), and likely also the names of Graz, Austria and Gartz, Germany. Cognate to these are English words such as yard, garth, girdle, and court. Also cognate but less closely related are Latin hortus, a garden, and its English descendants horticulture and orchard. Further afield, in ancient Iran, a fortified wooden settlement was called a gerd, or certa which also means garden (see the ancient Iranian cities with an ending-certa f.e. Hunoracerta). In Hungarian language kert literally means encircled. It became jerd under later Arab influence. Burugerd or Borujerd is a city in the West of Iran. The Indian suffix -garh, meaning a fort in Hindi, Sanskrit, and other Indo-Iranian languages, appears in many Indian place names. Given that both Slavic and Indo-Iranian are sub-branches of Indo-European and that there are numerous similarities in Russian vocabulary and Sanskrit vocabulary, it is plausible that garh and gorod are related, although this is strongly contradicted by the phoneme /g/ in Indo-Iranian, which cannot be a reflex of the Indo-European palatovelar /*ǵ/. The Polish word for suburbium, podgrodzie, literally means a settlement beneath a town: the gród was frequently built at the top of a hill, and the podgrodzie at its foot. (The Slavic prefix pod-, meaning "under/below" and descending from the Proto-Indo-European root pṓds, meaning foot, is equivalent to Latin sub-.) The word survives in the names of several villages (Podgrodzie, Subcarpathian Voivodeship) and town districts (e.g., that of Olsztyn), as well as in the names of the German municipalities Puttgarden, Wagria and Putgarten, Rügen. Some cities in India – Chandigarh, Aligarh, Ramgarh (district). Garðaríki – Varangian name for Kievan Rus, interpreted as "cities"
Biskupin, a life-size reconstruction of a gord-like Lusatian settlement in Poland. ^ "Urban vocabulary in Northern India – City Words WP No. 4". www.unesco.org. Retrieved 2016-05-09. ^ "Sanskrit and Russian: Ancient kinship". in.rbth.com. Retrieved 2016-05-09. ^ Taylor, Isaac (1898). Names and Their Histories: A Handbook of Historical Geography and Topographical Nomenclature. Original from the University of Michigan: Rivingtons. p. 331. ^ Taylor, Isaac (1864). Words and Places, Or, Etymological Illustrations of History, Ethnology, and Geography. Original from Oxford University: Macmillan. p. 128. ^ Anthropologische Gesellschaft in Wien (1880). Mittheilungen der anthropologischen Gesellschaft in Wien. Original from the University of Michigan: F. Berger & Söhne. p. 40. Reconstruction of a gród at Grzybowo, Poland – images of a typical ancient Slavic settlement with suburbium, earth-and-wood wall and moat; by Tomek Birezowski (Polish text).